Thank goodness I hired a creative, fun person for Teen Services! Go Emily (and Becky of course)! So Becky came up with another fantastic passive program last week. It definitely gave me a good chuckle. 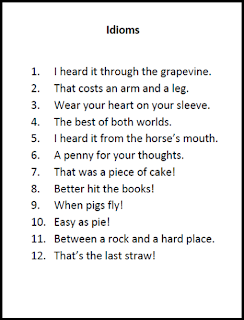 We hosted a "Draw the Idiom" contest. All you need is a flyer listing the idioms (which I've included below), a stack of blank white paper, and a container of pencils and markers. Voila! Free, cheap, and fun program for any size teen room. And to top it off, you might just get some cool artwork for your walls. I'll try to post some of our entries later this week. 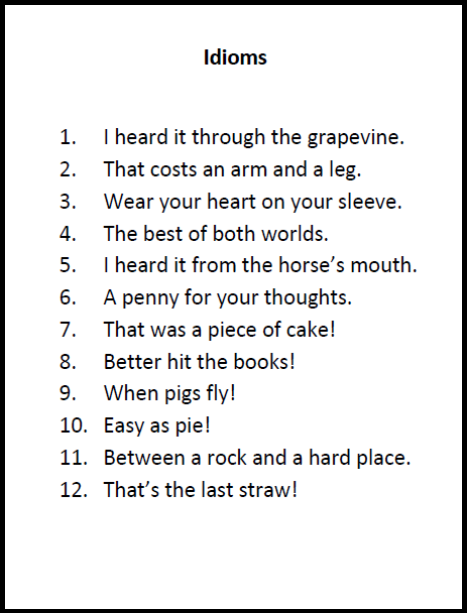 But for now, enjoy the idioms!